We are very proud to announce that Assumption3397.org has been recognized by the Knights of Columbus New Jersey Council as the Council Website of the Year for the Camden Diocese. Websites are ranked on a 100 point grade and our site received 100 out of 100 points. Along with our council’s meetings, Facebook page, service activities and visibility within the Parish of St. Bridget and the South Jersey community, Assumption3397.org is one of the primary ways we promote the viability of our council and the positive effect Knights have on their communities around the world. District Deputy Joe Williams presented the award to the council’s webmaster and Deputy Grand Knight Mike Walsh during the council’s officer installation ceremony. District Deputy Joe Williams presents the Website of the Year award to Deputy Grand Knight and Webmaster Mike Walsh. As 2014 comes to a close, we are pleased to note that it has been a successful year for our council. Our knights have taken part in a host of activities in support of the St. Bridget’s Parish, its many ministries and the community at large. We hope to continue and expand our activities in the 2015. 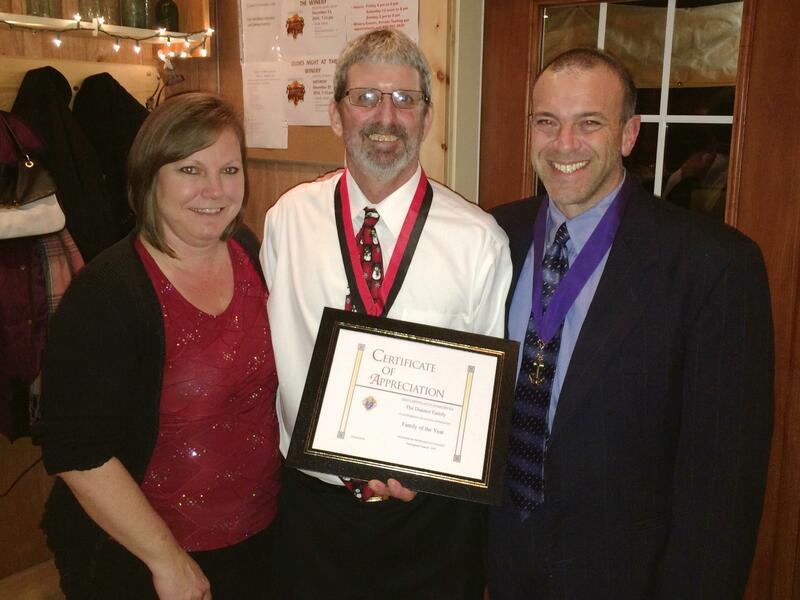 As a cap to this year, Assumption Council 3397 held their Christmas Party at Summit City Winery on December 19 and bestowed its end-of-year awards on some very deserving people. Eliza and Al Duaime receive the Family of the Year award from Grand Knight Ray Iacovone. We are very proud to name the Duaime family as Council’s Family of the Year. The Duaime’s are a constant presence in both the parish and the community. They are a source of support, without whom many projects would not be completed successfully. Congratulations to Worthy Warden Al Duaime and his wife Eliza and their children. 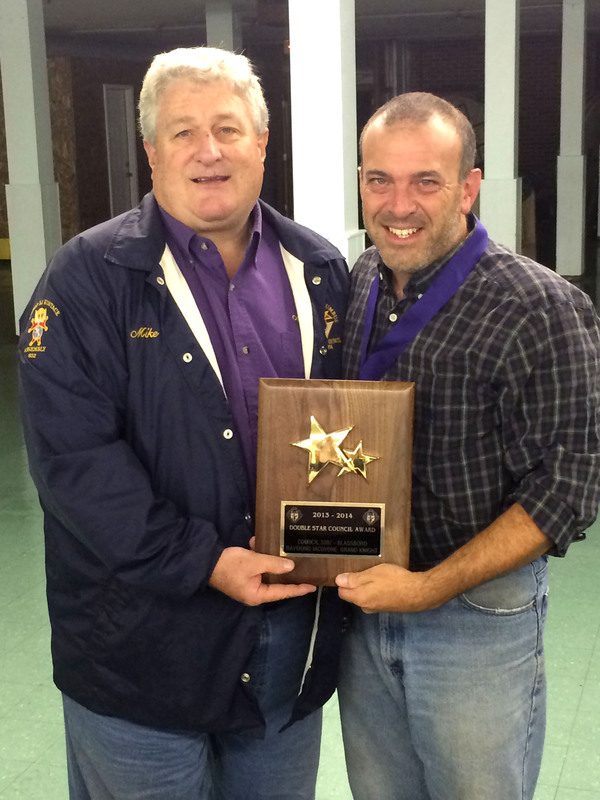 Chaplain of the Year, Deacon Kevin Heil receives his Shining Armor Award from Grand Knight Ray Iacovone. Always wearing his two hats flawlessly, council was very pleased to recognize Deacon Kevin Heil, our Worthy Advocate, as this year’s Chaplain of the Year. Deacon Kevin’s faith and experience are highly regarded among the council knights. He is our living reminder that our service is directly tied to our faith and the path God has set out for us. Deacon Kevin also received his Shining Armor Award during the Christmas gathering. 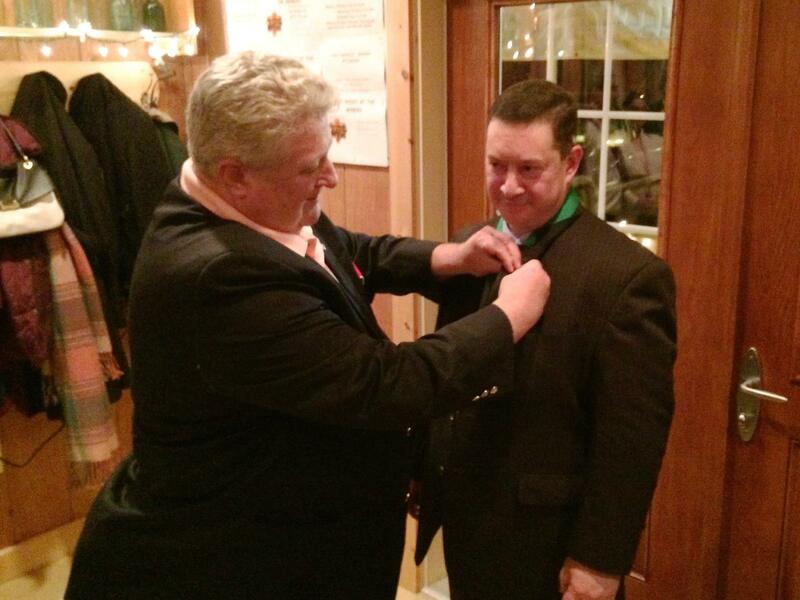 Grand Knight Ray Iacovone receives his Star Award pin from District Deputy Mike Walter. Ray Iacovone and then-Membership Director Jim Cosgrove. 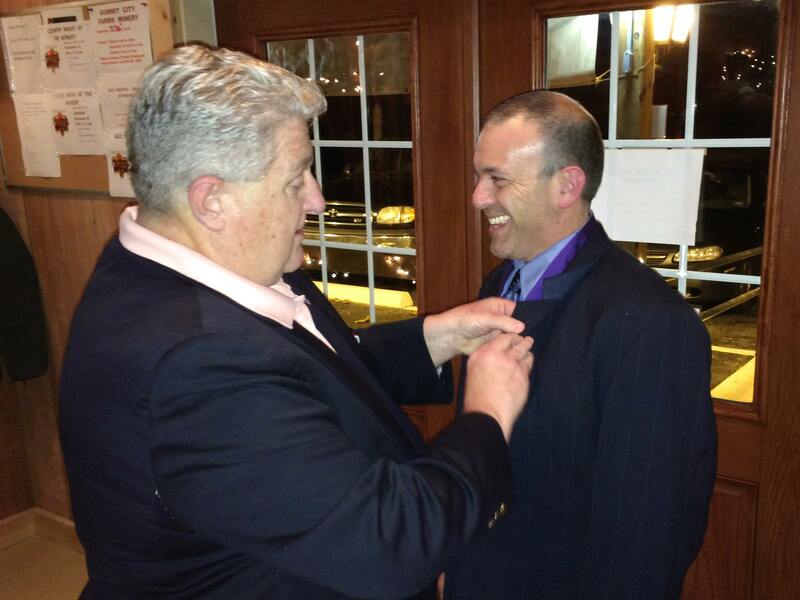 District Deputy Mike Walters awarded both Knights with their ceremonial pins during the event. Chancellor Mike Walsh and Grand Knight Ray Iacovone take a selfie with the Knight of the Year Award. 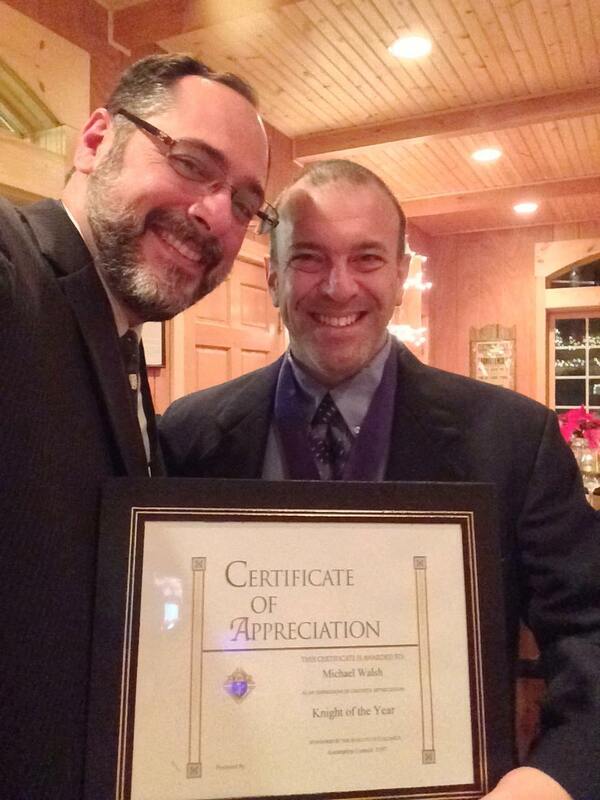 Our council was pleased to bestow on Chancellor Mike Walsh the Knight of the Year Award. Mike received the Shining Armor Award earlier this year and has been a very active member of the council since he joined in 2013. Assumption 3397 has benefited from the use of his marketing and PR background, which in turn has helped raise the awareness of the council in both the parish and the community. 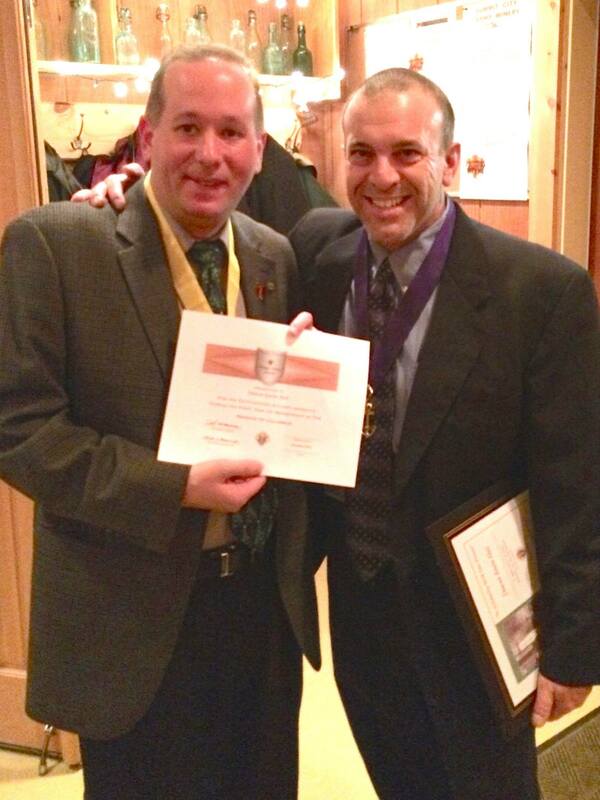 District Deputy Mike Walter presents the Double Star Award to Grand Knight Ray Iacovone. Knights of Columbus Assumption Council 3397 has received recognition as a Double Star Council for the 2013-14 fraternal year. The award recognizes overall excellence in the areas of membership recruitment and retention, promotion of the fraternal insurance program and sponsorship of service-oriented activities. The award was presented to the membership by District Deputy Mike Walter at the council’s business meeting on October 7. 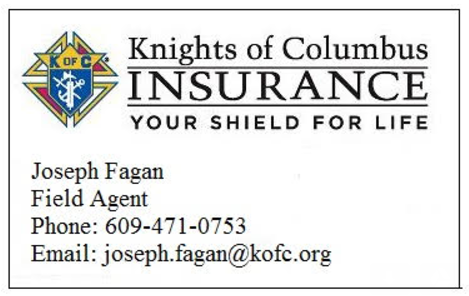 The Knights of Columbus is the world’s largest Catholic lay organization. It provides members and their families with volunteer opportunities in service to the Catholic Church, their communities, families and young people. With more than 1.8 million members in over 13,000 councils around the world, the Knights of Columbus annually donates more than $170 million and 70 million hours of service to charitable causes. Please visit http://www.kofc.org for more information.